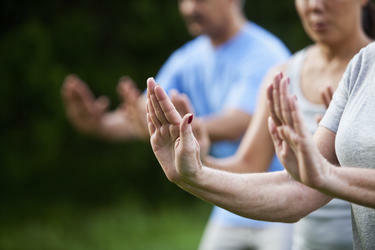 Most people know that there are many different forms of martial arts. Ask the average student interested in studying ancient combat practices, and they will tell you they’ve heard of at least a few: Karate, for sure, and probably Kung Fu, Jiu-Jitsu, and Tae Kwon Do. In recent years Krav Maga, the self-defense system developed by the Israel Defense Forces, as well as Muy Thai, the Thai system of boxing that is something of a national sport in Thailand, have also gained in popularity. But did you know that there are hundreds of distinct styles and schools of martial arts, all with their own unique histories, philosophies and styles? One such style is Han Mu Do. Han Mu Do means Korean Martial Arts. A Korean philosophy rooted in the idea of balance and equilibrium, Han Mu Do was created by Grandmaster He-Young Kimm, who crafted the practice after studying both the traditional and modern Korean martial arts for more than 40 years. Students who take martial arts classes in Han Mu Do learn physical self-defense moves that are based in the school’s three tenets of optimism, balance and harmony. Like many martial arts practices, Han Mu Do is a study for both the body and the mind, and its classes emphasize development skills that apply both during physical practice and also outside during the rest of the students’ lives. Because Dr. Kimm created Han Mu Do after studying a number of traditional Korean martial arts, the practice offers students a fighting system that encompasses a variety of combat strategies. These include hand strikes and leg kicks; empty hand techniques; choking, throwing, grappling and ground fighting; and how to attack pressure points and body cavities for maximum impact. They also include the skills of joint locks and bone separation, as well as general knowledge of Korean weapons. Dr. Kimm trained under a number of masters of various Korean martial arts before creating Han Mu Do with the goal of offering students a defense system that incorporates the most powerful aspects of the different schools. In the 1950s, Dr. Kimm noticed that Korean self-defense techniques were due for an upgrade; the ancient schools of martial arts were miles removed from the modern self-defense techniques being practiced across the nation, and he wanted to find a way to bring them together. Dr. Kimm began conducting interviews and doing research on the many forms of Korean martial arts, and then began training himself. He learned under masters of a number of Korean martial arts practices, including Tae Kyun, Soo Byuk Ta, Yu Do, Yu Sul and Tae Kwon Do, Kum Do, Kum Sool, Kung Do, Kung Sul, Hapkido, Kuk Sool, Ship Phal Ki, and Son Do Sul. Dr. Kimm made sure that he understood both the deep inner philosophies of those practices as well as the practical elements. When he felt he truly understood the great umbrella that is Korean martial arts practices, Dr. Kimm selected techniques and practices from across the spectrum and combined them into one grand martial arts school, Han Mu Do. Everything a Han Mu Do student studies revolves around balance: how to balance techniques that include weapons with those that don’t; how to balance traditional ancient philosophy with new and fresh ideas; how to balance your right and left sides while fighting; and how to balance the physical (external) with the mental (internal). While students are learning kicks, punches, sweeps and blocks, they are also gaining flexibility, speed and core strength. At the core of Han Mu Do teaching is the idea of harnessing your opponent’s power against themselves. Students tap into the idea of the Ki — their internal energy — learning breathing exercises to control, increase and capitalize on the immense strength at their disposal. Han Mu Do is an art of quiet strength. Its moves are swift and elegant, and in Han Mu Do martial arts classes, students learn not to build muscle or produce big, dramatic chops and strikes, but rather to tap into a deep, fiery power within themselves — a power that all humans have — and to control it, stoke it at will, and use it with care and responsibility. Justin Martin is a 2nd Degree Black Belt and Certified Instructor of Han Mu Do, having studied under Dr. He-Young Kimm. Mr. Martin has trained in various styles of martial arts and is passionate about teaching martial arts classes for both adults and kids. 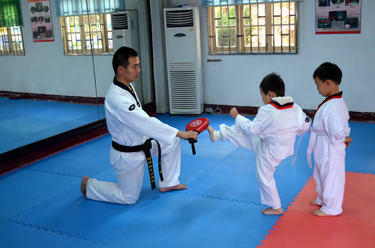 Mr. Martin’s studio, Harvest Martial Arts, teaches Han Mu Do classes for children and adults.